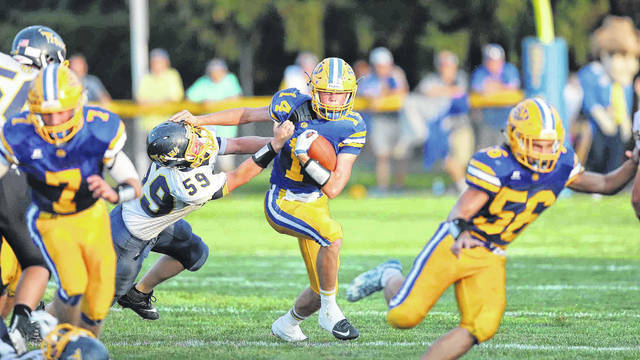 St.Marys’ quarterbackl Braeden Dunlap (14) has seen his role expand as the Rider signal caller. Dunlap is not only a threat to run but to pass the ball and this year he has more than 200 yards through the air and five touchdowns with no interceptions. ST. MARYS – Could St. Marys out pass Kenton? But don’t be surprised if the Roughriders throw more than you think when they face Kenton in a key Western Buckeye League showdown Friday nights. When asked if expects to “out pass” Kenton, Frye replies with a slight smile and a chuckle. Both teams are undefeated in the WBL with identical 3-0 marks. St. Marys owns a 4-0 overall mark and Kenton is 3-1 with an opening game loss to powerhouse Coldwater. Frye said there are three reasons why St. Marys is once again undefeated and ranked No. 1 in Division IV and that is a solid coaching staff that has been together for five years, depth and the relationship that has developed between the coaches and players that led to a strong work ethic by both parties. Against Ottawa-Glandorf earlier this year, the Riders introduced their own version of the wildcat offense where the quarterback’s options includes the pass and it proved effective against the Titans in a 35-7 victory. However, St. Marys struggled last week against Shawnee and like last year, escaped with a one-point win, 27-26. Frye said the game against the Indians is typical of the WBL where any team at any time can come up and give you a run for your money. The Roughriders will have their hand’s full stopping the passing attack of Kenton. Led by the dual threat quarterback, Jaron Sharp, the Wildcats offense is averaging 424 total yards a game. The Roughrider defense is ranked No. 1 defense in the WBL giving up an average of 212 yards. Frye said being a defensive coordinator has probably been the toughest job the last 10 or 15 years with the introduction of the pass happy offense and Kenton was one of the first schools to embrace it and he is looking for his defensive coordinator Nick Yahl to come up with a plan to stop the high octane Wildcats. Frye added that what is different about Kenton’s is that they do it better than any other team out there. Wapakoneta contained Sharp for the most part, limiting him to one touchdown toss, but Sharp showed his ability to make things happened and delivered a late drive to upend the Redskins. Offensively, the Riders, who have expanded their repertoire, will be facing a Wildcat defense that held the Redskins to 10 points and 260 yards on the ground. More importantly Kenton’s defense forced two fumbles. Frye added that the key to winning is to avoid those turnovers and win the battle in the trenches. In other WBL games, Celina (3-1, 2-1) travels to Ottawa-Glandorf (2-2, 1-2), Elida (2-2, 2-1) to host Wapakoneta (3-1, 2-1), Van Wert (2-2, 1-2) takes on Shawnee (1-3, 0-3) and Bath(0-4, 0-3) battles Defiance. https://www.limaohio.com/wp-content/uploads/sites/54/2018/09/web1_SMFBvs-OG-DS3.jpgSt.Marys’ quarterbackl Braeden Dunlap (14) has seen his role expand as the Rider signal caller. Dunlap is not only a threat to run but to pass the ball and this year he has more than 200 yards through the air and five touchdowns with no interceptions.